When we think of Gettysburg, we instantly conjure up images of Abraham Lincoln eloquently speaking his famous Gettysburg Address, a direct result of the fallout from the three-day Battle of Gettysburg — one of the largest and most internationally well-known American Civil War battles. Certainly, this southern Pennsylvania city offers incredible historical significance to residents, as well as the nation. However, investing in Gettysburg, PA real estate means getting more than just ties to our past. Gettysburg is also a thriving, up-and-coming community that offers something for every person, young or old. 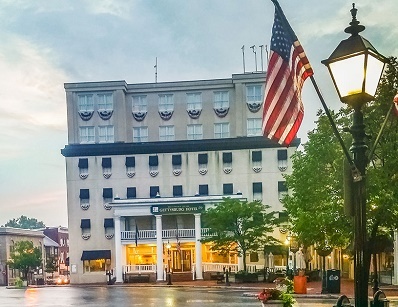 Thanks to Gettysburg’s inherent popularity as both a tourist’s destination and a wonderful place to live, the borough promises a series of walker-friendly, well-maintained main streets that converge at Lincoln Square. Stroll to casual and fine dining restaurants, window shop for antiques, or enjoy the genuine allure of tree-lined streets and Federal-style homes and inns. For recreation, there’s no better place to jog or bike than the miles of well-kept roadways and paths of the Battlefield. Looking to live in a town that makes it simple to adopt a healthier lifestyle? Choosing a home through Century 21® in Gettysburg is a wise decision! Because agriculture is one of the stronger industry sectors in the Adams County region, you’ll have plenty of opportunities to eat organic produce, meats and other goods. Many farmers’ markets operate in and out of Gettysburg, where you can purchase everything from fresh eggs to canned jellies. And adults looking to add locally sourced wines to their tables will appreciate Gettysburg’s highly rated wineries. Whether you’re seeking an elementary school, high school or college atmosphere, living in Gettysburg offers a variety of educational opportunities. The Gettysburg Area School District is a well-respected learning environment. Parents who are seeking an alternate type of education for their children can also choose to send them to one of the public charter schools in the area, or private institutes for K-12 learning. Several institutes of higher education are also within and close by the borough of Gettysburg. These include Gettysburg College, Harrisburg Area Community College Gettysburg Campus, and Lutheran Theological Seminary. Each facility provides distinctive curricula aimed at its core student population. Additionally, these educational institutions are considered some of the bigger employers in the area, along with The Gettysburg Hospital and the U.S. National Park Service. If you’re buying a house for sale in Gettysburg, PA, one of the first things you’ll notice is the variety. If you’re interested in living in a luxurious, historic property, you’ll find the character and charm you’ve always dreamed about. In fact, some of the residences along the main streets of Gettysburg exhibit old-world craftsmanship that many homeowners find irresistibly elegant and unique. If you’re looking for more modern Gettysburg, PA homes for sale, planned residential neighborhoods dot the outskirts of the city. They boast a range of architectural styles, from contemporary to classic. When you’re ready to explore the variety of Gettysburg homes for sale, CENTURY 21 Core Partners can help. We’ll be happy to show you why the borough of Gettysburg in Pennsylvania has earned its reputation as a charming place to live and work. Contact us today to get started.